Four problems bedevil the nuclear energy sector: proliferation, political coyness over technology options that discourage proliferation, radioactive waste, and -- of course -- money. The conference was polarised on the proliferation question. Sombrely, it discussed a world full of peace- and plutonium-filching terrorists. The US wants to shut down Iran's nuclear programme, to -- it says -- stop proliferation. IAEA officials admitted such political posturing made it difficult for all nations to access nuclear technology. "We see a great future for nuclear energy and at the same time have all kinds of restrictions on technology transfer for peaceful uses. It is a contradiction that might affect the future," said I Ennison of Ghana Atomic Energy Commission. In a conference discussion paper, IAEA said states shouldn't import nuclear fuel to non-proliferation treaty signatories found producing nuclear weapons. IAEA could create its own nuclear fuel reserve, to be used use if a state reneged on its commitment to export nuclear fuel, was another suggestion. Consensus eluded both ideas. Yet another dilemma got thrown up. 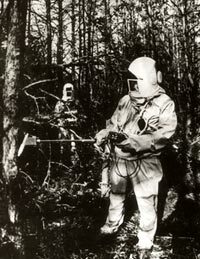 Internationally, efforts were on to create technology that was proliferation-resistant. Such technology was safe, but expensive. Only the richest nations could afford it. And how would nations compete in selling cooperatively produced know-how? Within the rubric of such questions, two initiatives were intensely discussed. The 19-nation International Project On Innovative Nuclear Reactors and Fuel Cycles (INPRO), begun in 2000 (a thinktank for future reactors, for instance those with a closed fuel cycle, so producing too little spent nuclear fuel for a bomb), and the one called Generation-IV (GEN-IV), initiated by the US along with the Russian Federation and IAEA. Both technologies, it was agreed, were fund-gobblers, for they needed huge inputs from physical science, materials science, nanoscience and other technologies. The initiatives catered to two different blocs -- GEN-IV comprises 11 nations that have selected six technologies suitable for industrialised countries; INPRO helps developing countries, which will make the greatest demand for energy in the next 50-100 years; eight nations are in both groups -- and there was no agreement on disseminating technology. At the conference, scientists were polarised: it looked like a (polite) fight between nuclear haves and have-nots. Steur stressed that though the two programmes differed, they worked together..
GEN-IV will develop advanced commercial reactors. The project has been divided into a 'near-term' (GEN-IV A) component that will develop thermal systems for advanced high-burn up fuels and 'long-term' GEN-IV-B systems using fast reactors. "The US, which has not ordered a new nuclear plant in more than 25 years, must break the barrier," said William Magwood, director of US department of energy's office of energy, science and technology. INPRO, when it began, had a non-budgetary account with IAEA but from 2004 became part of agency work. INPRO phase IA, which finished in June 2003, has developed a method to assess innovative reactor systems. Phase IB ended in June this year and seeks to validate the methodology developed earlier by applying it to a number of case studies, like Argentina's carem reactor and China's Pebble-Bed reactor. "The challenge of proliferation is intrinsic to INPRO's work. But theft and terrorism have a put a question mark on it. This is particularly after 9/11 and international pressure to secure everything from terrorism," said Steur. INPRO is based on two principles: use proliferation-resistant technology and conventions and state commitments to fuel supply and return agreements, and institutional arrangements. It wants international cooperation for the first. But the US is wary. That's why INPRO and GEN IV have not linked. Ideas, like applying INPRO's assessment method to GEN IV, have been dumped. "For the time being no one is interested," said Vyacheslav Kuznetsov of Russia's Institute of Innovative Energy. And to stop proliferation, IAEA needs 3,000 new inspectors. A similar lack of consensus has landed the International Thermonuclear Experimental reactor (ITER) in a political cul-de-sac. This ambitious nuclear fusion project involving many countries was mentioned in passing at the meeting. It failed to receive further commitments. The ITER consortium is deadlocked over where the reactor should be built. The US, Russia and China want the reactor to be built at Cadarache in France, but the US, South Korea and Tokyo support a Japanese site, Rokkasho-mura. Yevgeny Velikov, who has been working on nuclear fusion since 1978, said it was important to decide the site in the next three months. "If there's a decision this year, ITER could start operating eight-and-a-half years later," he said. "All the design and technical details are settled, and the funding -- it's only the site we're waiting for. But that's a very political decision. And an election year in the US is a bad time for agreements." No country on Earth knows how to dispose off radioactive wastes safely and permanently (see box: International dump yard). In other words, spent uranium must be guarded for at least 15,000 years, and plutonium for about 75,000-100,000 years. Every year the world's 442 nuclear plants produce 12,000 tonnes of radioactive waste. Add 50,000 tonnes of plutonium, if nuclear weapons are dismantled. "More than 50 countries need to dispose off nuclear waste," said ElBaradei. "We are talking about a (storage) guarantee of say at least 10,000-15,000 years," said Ken E Brockman, safety expert at IAEA. Nuclear power is expected to grow between 2015 and 2050. Where will the waste go? It took USA 47 years to find a permanent dump: Yucca Mountain in the Nevada desert. This alone would not help: merely to dispose off wastes that keep getting produced, it has to build disposal sites every four years for 50 years. Several nuclear power pioneers and countries with nuclear programmes for military use also have their 'legacy wastes'. The UK has 90 tonnes of plutonium waste and will accumulate more when it dismantles nuclear weapons. Disposing this off is estimated to cost some US $93 billion. What about India? Said Kakodkar: "Our waste is very small and we need not worry now." But India's nuclear programme is an old one, and yet it has never disclosed how much radioactive waste it has. Moreover, its search for a permannent disposal site has failed: both the Kolar gold fields and Pokhran were tried, and then rejected. As no other country wants a disposal site on its soil, an international effort is on for cooperative disposal. In July 2004, Russian President Vladimir Putin called for regional disposal sites and the IAEA keenly accepted. No one else did. Russia offered to store the spent fuels of other countries at the Mayak Chemical Combine facility in the Southern Urals, but there were no takers. It hoped to get US $20 billion for modernising its nuclear establishment. No country has accepted the offer. In May 2004, US energy secretary Spencer Abraham announced the Global Threat Reduction Initiative (GTRI), which by 2005 will call back all highly enriched uranium the former USSR supplied to 17 nations. The spent fuel of this uranium will be retrieved by 2010. Both will be shipped to Russia for storage -- a huge project for which the US is spending US $450 million. Environmentalists like Alexei Yablokov, president of Moscow-based Centre for Ecological Policy of Russia, support GTIR: "This very good step should have been taken long ago." But can all the fuel the USSR sent out be traced? If this looks daunting, then consider the GTIR plan: convert highly enriched uranium at 100 reactors in 40 countries to low-grade uranium by 2013. In Russia's case, low-grade uranium will be used at US power plants. But how will Russia do this? Its only spent fuel reprocessing plant, at Mayak, is swamped with the spent fuel of rusting nuclear submarines. The cost of producing nuclear energy is, in any case, a major hurdle to its commercial acceptability. In the EU and industrialised nations, the deregulation of electricity markets has further precipitated the problem, for nuclear power must now compete with coal, gas and hydro-electricity. This has had a peculiar fallout: while profits are up at well-run nuclear plants (mostly in developed countries), setting up new plants has become prohibitive. For operating plants, high construction costs have either been paid off or written off as subsidies, thus lowering operational costs -- often lower than coal and gas-bas based power stations. Thus any increase in productivity in existing plants directly translates into profits. In France and the US this has led to existing plants being efficiently managed. Indeed, this has become a worldwide trend: in 1990, nuclear power plants were, on average, running for 71 per cent of their time. This has gone up to 84 per cent in 2003; an improvement, according to the IAEA, equal to building about 34 new 1000 megawatt nuclear plants, almost free. But new plants cost up to three times more to build than fossil-fuelled plants. Completion takes about 12-15 years, blocking return on capital investments. In fact, from being a blueprint to turning operational usually takes 25-30 years. "I don't think any investor would pump in money and wait for three decades to get the return," says Ronald Steur of IAEA. In a deregulated market, nuclear power becomes severely unlucrative. As proof, one needs to only track the manner in which, in Western Europe and North America, recent investments have veered towards natural gas. This is why the mega expansion of nuclear power is occurring in countries where electricity demand is rising, but supply alternatives aren't. Thus in western Europe and North America, where electricity demand is growing relatively slowly and alternatives like hydropower, gas and coal are in plenty, there has been no new construction since the Civaux-2 reactor in France in 1999. On the other hand Japan and South Korea, where alternatives are fewer, have begun four nuclear power plants in the last three years and three more are under construction. These countries face disruption in the import of natural gas and oil. Similarly China and India: a growing economy and corresponding energy demand leads to reactors. "New nuclear power plants with shorter construction times and significantly lower capital costs could help promote a new era of nuclear power," said Yuri Sokolov, IAEA deputy director for nuclear energy. "In India nuclear is the only viable source left for us," says B R Grover, BARC's strategic planning group head. The Central Electricity Authority, in a 1998 report Generating Capacity Planning Studies has suggested power generation for the next 15 years i.e. 2015. It suggests a nuclear power addition of about 12,485 megawatts by the end of the 11th Plan. India has spent huge amounts of money on its nuclear programme. Now, as it takes up power generation in a big way, it lacks investments. Since the government is the sole investor the money is not always available. That is why India wishes to amend the Atomic Energy Act: pave the way for private participation. The cabinet is yet to decide on this.